WASHINGTON—A top Chinese official offered an olive branch to America, saying that Beijing wants to resume trade talks with Washington. 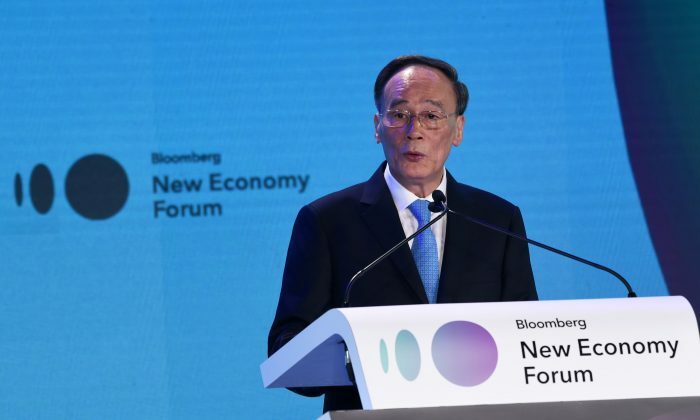 “The Chinese side is ready to have a discussion with the United States on issues of mutual concern and work for a solution on trade acceptable to both sides,” Chinese Vice Chairman Wang Qishan said at the Bloomberg New Economy Forum in Singapore on Nov. 6. Wang’s speech came amid an effort by top Communist Party leaders to calm global investors disturbed by the U.S.–China trade war and a worsening economic slowdown in the world’s second-largest economy. Escalation of the trade war and a collapsing economy caused panic selling in the Chinese stock market this year. Overall, the Shanghai Composite has lost almost 25 percent of its value since hitting a peak in January. And the smaller-cap Shenzhen Composite Index declined more than 30 percent. Both benchmarks are now deep in bear-market territory. Asia stocks had a mixed response to Wang’s comments. Hong Kong’s Hang Seng Index gained 0.8 percent while mainland China’s markets ended the trading day lower on Nov. 6. Wang’s speech had a more conciliatory tone than Xi’s confrontational remarks at the opening of an international business fair in Shanghai on Nov. 5. In his speech, the Chinese leader criticized Trump’s trade approach, denouncing “law of the jungle” and “beggar-thy-neighbor” trade practices. Xi’s comments dented hopes that both sides could end the tension at the G20 summit in Argentina this month. Xi also tried to ease concerns about China’s economic situation. Both Wang and Xi portrayed themselves as free traders, promising to lower import tariffs and improve access to the Chinese market. Chinese officials, however, have given no indication that they’re ready to meet Washington’s long list of trade demands, such as ending cyber theft, forced joint ventures, and intellectual theft. Wang’s promises for more liberalization and compromise weren’t convincing enough, according to Scott Kennedy, head of China studies at the Center for Strategic and International Studies in Washington. Following Wang’s speech, he wrote on Twitter that Eurasia Group President and founder Ian Bremmer, who was a moderator at the forum in Singapore, asked audience members to raise their hands if they thought Wang’s speech showed a new willingness by Beijing for more liberalization and compromise. “Almost no one raised their hand. Wang didn’t win the room over,” Kennedy wrote. Europe is also aligned with Washington in its efforts to end the unfair economic and trade policies of Beijing. European companies are concerned about China’s rules requiring forced joint ventures, intellectual property theft, and unequal treatment of foreign companies, said Carlo D’Andrea, vice-president of the European Union Chamber of Commerce in China. For decades, Beijing hasn’t taken any concrete actions to fulfill its promises. And that’s the reason why the Trump administration has chosen to take a tougher stance on China’s decadeslong protectionist and trade-distorting policies. To end China’s “economic aggression,” Washington has levied duties on roughly $250 billion worth of Chinese goods and imposed restrictions on Chinese investments. The last round of trade talks with China ended in August with no concrete steps toward a deal. Trump said in a tweet on Nov. 1 that he had “a long and very good conversation” with Xi, offering some hope that trade tensions may cool after the G20 meeting.